Bring this classic-style deluxe-quality, plush, and luxurious set of three excellent bath sheets, made from premium Turkish combed cotton. Thick, two-ply construction and a chunky ribbed pattern give these bath sheets their impressive feel and look. Machine washable convenience adds to the sturdy and resilient performance of these towels enough to last for years to come. Pick from the natural and beautiful colors available and match with your bathroom color scheme. A mindful purchase for bathroom needs while adding to the decor. This set of 3 over-sized bath sheets in ribbed cotton serve as an excellent gift for loved ones on Housewarming and special days. All of our products are manufactured in Turkey with the finest material. We perform a strict quality-check on our entire stock. Only the best units are delivered to the buyer for a happy and delightful customer experience. 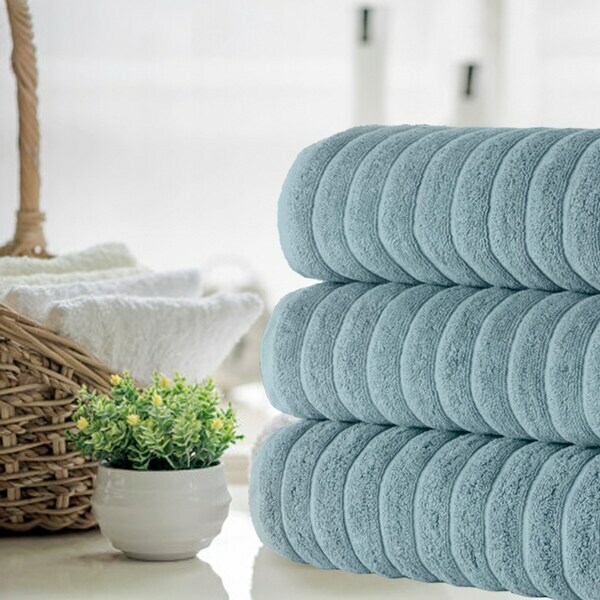 Our range of products includes beach towels, bath towels, hand towels, bath sheets, towel sets, kids towels, bathrobes, bath mats, pillowcases, and duvet covers. Order now and add luxury to your home bedding & bath decor with only the best. Dimensions 18.0 In. X 14.0 In. X 7.0 In. These towels, Maxima Turkish Cotton Bath Sheets are wonderful! Very thick and plush and absorbent. 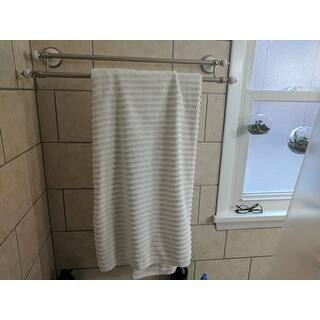 Also look at the size- 40x67”- that’s a Towel even my 6’5” son-in-law loves!The towels come in a nice range of colors which will go with most bathroom decor. Great purchase. Absolutely immense and heavy towels. I have seen lighter floor mats! LOL. I have used them a couple times and they absorb well. They wash very well Held their shape. No shrinking or puckering at the bound edges after warm water wash and tumble dry and no stray or pulled threads.. First washing produced very little dryer lint which is very unusual for new towels. Good value for the money paid. I ordered these for our bathrooms to go with navy accents. I like the color (bright white) and I like the texture. The towels are large and nice and I personally like them fine. My husband thinks they lack the softeness and absorbsion qualities of our regular size/quality towels. We also have some large navy bath sheets without texture and he likes these much better. I did order the similar hand towels because I like the textured look. Large, heavy cotton, beautiful towels. We ordered 3 sets about two years ago. We just bought 6 more sets for guest baths and Christmas gifts. WE highly recommend these bath sheets! Luxurious! I love these towels. They are huge, thick, and very high quality. I like a towel that is not very fuzzy or plush. Also one that does not leave lint. Some people don't like that type of towel, so that is why I am describing what I like. These are very thick and large. Like a throw even. I have ordered these more than once. Luxe for the home bath! What a bargain this was. I bought two sets of these towels. Plush, heavy, turkish cotton. Not thick, dense chenille that won't dry and not flimsy and nonabsorbent. Ribbing lends upscale look. These add a clean, sophisticated look to the bath. Can't go wrong with bath sheets - one size fits all. These towels are fantastic! I but the grey towels.and the color is spot on. They’re slightly bigger than a bath sheet which I find great. they’re very thick and absorb the water quickly. Since it is a large towel it does take a little bit longer to dry but I can cope with that. I highly recommend this product as you will not find a towel anywhere to match this caliber of craftsmanship and durability. I like them so much I’m going to purchase another set and ive only had them 1 day. These bath sheets are very good quality towels. They are heavy and plush while being soft. They absorb water very well. Anyone who doesn't like heavy towels will not like these bath sheets. I was looking for a nice feeling bath sheet and these are definitely IT! A towel that wraps around your entire body without feeling like it’s too tight is just cozy. One that’s this soft is another bonus. It’s hard to purchase certain products without being able to touch them first. I appreciate those who left reviews detailed enough to help me make a purchase decision. If you’re considering these towels, you won’t go wrong. If I HAD to choose one downside, it’s only that they come in sets of three, rather than two or four, but that may be a plus for others. Bought these bath sheets for my daughter. She specifically wanted bath sheets great price nice quality size of a beach towel exactly what she wanted. I was looking for some bigger towels for my guest room and I always pick white because it's bleach-able. These are soft! The look and feel like high quality towels, yet I got them for next to nothing on Overstock. Such a great size and they are very soft. Exactly what I was looking for. We love these bath sheets! There is nothing worse than having a towel that barely wraps around you. Now we have something that makes us feel like we are at a spa everyday! Big, really big, thirsty, cotton towels - none of the treated softness that makes drying off impossible - the pattern runs across the towel so if this bothers you - just beware. Softer wash after wash - I didn't have an atypical lint problem but as with all towels remember to watch your lint filter - I love them. I bought these same towels 2 years ago. The first set were awesome. Loved them! Thick and great quality. This order was awful. Super thin towels. Not happy with these towels at all. Although these towels are very large, I feel like im drying off with cheap hotel towel. When I bought these online, the picture appeared to show that these were very absorbent and plush, but they are not. I use them to line the floor in my bathroom! Ohh yeah, those bath mat towels you get in hotels to put on the floor, that's what these feel like, maybe only slightly better. Only 2 starred for the size. It can cover my whole floor. I have a small bathroom. So if you only need to line your floor, give them 5 stars. If you need to use them to dry off after a shower...keep shopping! These towels are huge and very pretty. They are not as thick as I had anticipated but I think they are well worth the money and would probably purchase again. LOVE these! They actually fit around my body and cover everything up. Not to mention they are soft and thick. I thought I was getting a color that was close to denim, but they turned out to have a real greenish color to them so I returned them. Nice towel, just wrong color. Great towels!! Love the size!! Love these towels! A little bigger than our standard towels. They are very comfy with the plush, puffy striped design. I will buy them again. Great towels at a super price! No complaints from the family, love the plush, absorbent material and high quality! Would definitely recommend purchasing! Great size and quality towels. Perfect size and larger than most - definitely a proper bath sheet not a bath towel! They stand up well to washing and drying. Would buy again for sure! "When will you have other colors besides white available?" More colors should be available by March 1st. "What hue is the blue? From the picture it looks like a green-blue." "How do I get these towels to not be all scratchy, and loosing threads?" Hello Bo P, I will leave our link on the care of towels. I hope this helps and thank you for shopping with us. "Is there loop on the towel for hanging on a hook?" Hello cookdaley, we appreciate your inquiry. There is no loop on the towel. We hope this information has been helpful. Thank you for shopping with us! The size and quality is wonderful.! the price unbeatable. I already ordered one set and am in love. The only thing better than 3 of these towels would be 6! Seems like a good price for 3 bath sheets...will reserve judgment until I receive and see the quality!! It seemed like a good deal! Because my neighbor has these and she loves them. Love the ribbed construction, while getting the benefits of a quality spa towel. Large bath sheet size and positive reviews. looks like it is soft and plush. need fat very large towels for our sauna. New lardge towels for my new home. The towels look lush and soft. I like bath sheets as oppose to bath towels. I want to wrap myself in luxury. "with these towels is it 3 bath sheets?" Thank you ldkosut for your interest in the Maxima Turkish Combed Cotton 3-piece Bath Sheet Set. This set is for bath sheets. It has been fixed on the web site and thank you for bringing it to our attention. Thank you for shopping with us!